Burkush, Kateryna 2018. On the forest front: labour relations and seasonal migration in 1960s–80s. Labor History, Vol. 59, Issue. 3, p. 295. Tysiachniouk, Maria Petrov, Andrey Kuklina, Vera and Krasnoshtanova, Natalia 2018. Between Soviet Legacy and Corporate Social Responsibility: Emerging Benefit Sharing Frameworks in the Irkutsk Oil Region, Russia. Sustainability, Vol. 10, Issue. 9, p. 3334. Uberti, Luca J. 2018. Corruption in transition economies: Socialist, Ottoman or structural?. Economic Systems, Vol. 42, Issue. 4, p. 533. Alexander, Catherine 2018. Homeless in the homeland: Housing protests in Kazakhstan. Critique of Anthropology, Vol. 38, Issue. 2, p. 204. Tadajewski, Mark Tadajewski, Mark and Stole, Inger L. 2016. Marketing and the Cold War: an overview. Journal of Historical Research in Marketing, Vol. 8, Issue. 1, p. 2. Gatejel, Luminita 2016. Appealing for a Car: Consumption Policies and Entitlement in the USSR, the GDR, and Romania, 1950s-1980s. Slavic Review, Vol. 75, Issue. 01, p. 122. Tadajewski, Mark and Reid, Susan E. 2016. Cold War binaries and the culture of consumption in the late Soviet home. Journal of Historical Research in Marketing, Vol. 8, Issue. 1, p. 17. Sahadeo, Jeff 2016. Black Snouts Go Home! Migration and Race in Late Soviet Leningrad and Moscow. The Journal of Modern History, Vol. 88, Issue. 4, p. 797. Hass, Jeffrey 2015. International Encyclopedia of the Social & Behavioral Sciences. p. 843. Sorgonà, Gregorio 2014. Gli euromissili e il Msi Il neofascismo italiano e la sua area giovanile di fronte al rilancio della Guerra fredda 1979-1983. ITALIA CONTEMPORANEA, p. 476. Jones, Polly 2014. Club Red: Vacation Travel and the Soviet Dream. By Diane P. Koenker. Ithaca: Cornell University Press, 2013. x, 307 pp. Notes. Bibliography. Index. Illustrations. Photographs. Tables. $39.95, hard bound.. Slavic Review, Vol. 73, Issue. 02, p. 387. Kurg, Andres 2012. Fractured Boundaries. Home Cultures, Vol. 9, Issue. 3, p. 257. Edele, Mark 2011. Writing the Stalin Era. p. 117. Sahadeo, Jeff 2011. The accidental traders: marginalization and opportunity from the southern republics to late Soviet Moscow. Central Asian Survey, Vol. 30, Issue. 3-4, p. 521. Zubok, Vladislav 2008. The Soviet Union and détente of the 1970s. Cold War History, Vol. 8, Issue. 4, p. 427. Turbine, Vikki 2007. Gender, Equality and Difference During And After State Socialism. p. 167. Xin, Xiaohui and Rudel, Thomas K. 2004. The Context for Political Corruption: A Cross-National Analysis*. Social Science Quarterly, Vol. 85, Issue. 2, p. 294. Harrison, Mark 2002. Brezhnev Reconsidered. p. 38. Clark, William A. and Jos, Philip H. 2000. Comparative anti-corruption policy: the american, soviet and russian cases. International Journal of Public Administration, Vol. 23, Issue. 1, p. 101. Sakwa, Richard 2000. Party Finance and Political Corruption. p. 123. 1. Dunham, Vera S., In Stalin's Time. Middleclass Values in Soviet Fiction (New York: Cambridge University Press, 1976). See especially pp. 3–5. 2. See, for example, the pronouncements in Stalin, Joseph, Economic Problems of Socialism inthe U.S.S.R. (Peking: Foreign Languages Press, 1972). 3. Consider, for example, Khrushchev's prediction: “In the coming 10 years all Soviet Peoplewill be able to obtain consumer goods in sufficiency, and in the following 10 years the consumerdemand will be met in full.” Documents of the 22nd Congress of the CPSU, vol. 2, “Report on theProgram of the Communist Party of the Soviet Union,” October 17, 1961 (New York: CrosscurrentsPress, 1961), p. 85. 4. See McAuley, Alastair, Economic Welfare in the Soviet Union: Poverty, Living Standards, andInequality (Madison: University of Wisconsin Press, 1979); Michael Ellman, “A Note on the Distributionof Earning in the USSR under Brezhnev,” Slavic Review, 39, no. 4 (December 1980); BasileKerblay, “Social Inequality in the USSR,” Problems of Communism (January-February 1982); Nove, Alec, An Economic History of the USSR (New York: Penguin Books, 1982), especially pp. 347–49. 5. Statement of the Honorable Henry Rowen, Chairman, National Intelligence Council, CIA,Before the Joint Economic Committee, Congress of the United States, December 1, 1982 (mimeo),pp. 5–6. 6. For a discussion, see Millar, James R., The ABCs of Soviet Socialism (Urbana: University of Illinois Press, 1981), especially pp. 182–87. 7. The magnitude and burden of military expenditures remains a matter of dispute. See, forexample, Franklin D. Holzman, The Soviet Economy. Past, Present and Future, published in theHeadline Series by the Foreign Policy Association, no. 260 (September/October 1982), pp. 28–31. 8. Sources as in n. 6, and preliminary findings of the Soviet Interview Project. 9. Alec Nove, An Economic History, p. 368. 10. See, for example, Boulding, Kenneth E., Economic Analysis, 3rd ed. (New York: Harper & Brothers, 1955), chap. 37. 11. Ofer, Gur, The Service Sector in Soviet Economic Growth. A Comparative Study (Cambridge:Harvard University Press, 1973). 12. 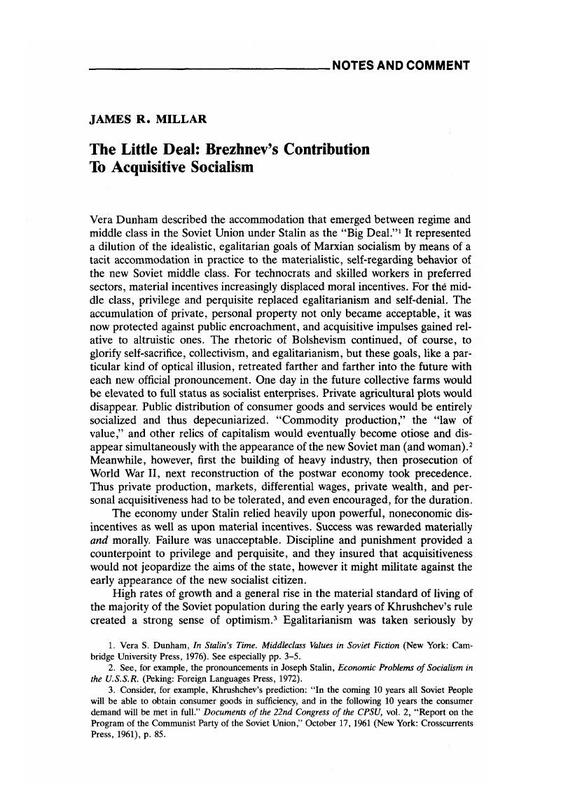 For a good, concise description see Gregory Grossman, “The Second Economy of theUSSR,” Problems of Communism (September-October 1977). 13. See, for example, Karl Polanw(%£ 6e1x Transformation (Boston, Mass. : Beacon Press,1957), especially chap. 4.